Yeah I don't think they can breed when they're trapped in separate cubbies like that. Don't they teach you where babies come from? You kind of have to be touching each other at least a little bit, I'm pretty sure. Lol hey man those fences are pretty thin, I'm sure you could work something out. I thought I saw in megatrains videos the ones trapped were still breeding, but it may have been that they were breeding with the ones running around or just attempting to breed and failing. Idk, but they're breeding now so I'm happy. I have noticed being trapped in small spaces affects villager ai though when I was screwing around making villager oriented mods. I noticed when my archer was trapped in a small space he wouldnt fight anything even inside of the box with him. But when you let him roam free in the village he would act as I had intended it to. Yeah, I think they can breed through a fence (trapped one breeds with one running around free) but not through a full block (two trapped ones in adjacent cells.) Sometimes I'll find a baby or, later on, a grown villager in with one who had been trapped before. I imagine it just has something to do with how physically close they can get to each other, and the cutoff seems to be somewhere between the thickness of a fence and the thickness of a full block. You definitely see the "please may I love you" hearts, but I don't think that villagers can breed at all when trapped like this, either through fences or blocks. They don't succeed in multiplying unless you have at least two free and able to interact with each other. Ah ok. Makes sense. 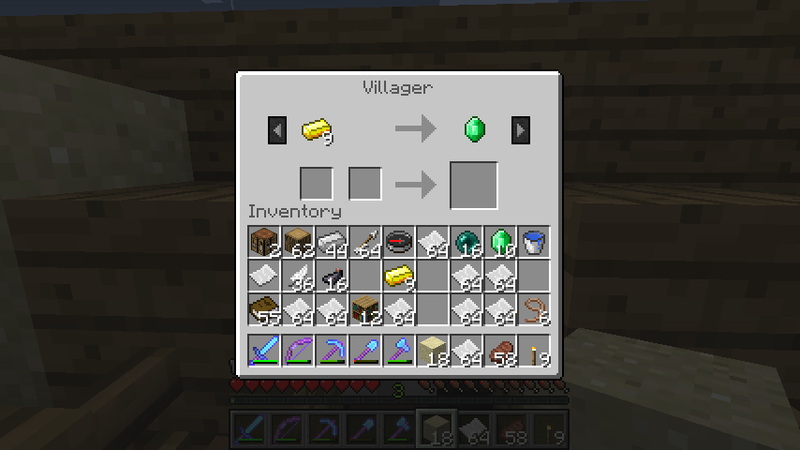 Anyways my village is up and running smoothly getting me tons of trades and iron. Great design. Simple and effective and even with your most basic design it has a lot of room to put some of the other things like automatic killers for the golems, I did a lava blade held up by fences with hoppers under it, added some pistons to trap them automatically and the kill pistons which people suggested and I'm loving it. Although I've noticed that the villagers will never go to the corners, and when I try to push them there they run like its not in the village radius. Even minecarted some guys into the corners and the rest still will not go into them. I haven't checked it in a few days but have you noticed this as well? Yeah they really don't seem to like the corners for whatever reason. Maybe it's because it's "inside" two "houses" at the same time? Regardless, I tore out the stalls in the corners of mine and just put in some chests and crafting tables. They also don't seem to like the outer ring of stalls at all, though not so much as they dislike the corner ones specifically. Whenever I push a guy into one of the inner stalls, he'll almost always just stand there and look stupid at me for a second, giving me plenty of time to drop a fence or shut the gate or whatever, but when I push one into one of the outer stalls instead, he fights me the whole time and runs out of it the first chance he gets. Yeah I'm having the same issue, although its not with all the outer ring stalls, just the ones closer to the corners. In the middle of a side they don't seem to mind too much. This is why I thought it may be a problem with the village radius size, I've just let those guys run around and be the breeders though. Yes, they definitely like the inner row of booths better than the outer. I've also recently had issues with baby villagers getting caught in the corners of the fence blocks between booths, I have to break those to let them out. Hey, IronMagus, have you seen a librarian with an unlocked gold trade in any recent version? The wiki says that trade has a 0.2666% chance, but I am pretty much convinced that can't be right. I went back and checked all my active and test villager levels, and couldn't find any, and some extended creative world testing similarly failed to unlock one after hundreds of attempts. (See context and extended discussion in this reddit thread). I saw one with the gold trade as his very first trade about a month ago on a vanilla 1.6.2 SMP server. Pretty sure that's the only time I've ever seen one that wasn't a priest or blacksmith villager asking for gold. I managed to get a perfect (minus gold) librarian on that server, and have traded for stacks and stacks of emeralds from him, going through dozens of double-chests worth of paper, and still the gold trade hasn't popped up. I saw one with the gold trade as his very first trade about a month ago on a vanilla 1.6.2 SMP server. Pretty sure that's the only time I've ever seen one that wasn't a priest or blacksmith villager asking for gold. I managed to get a perfect (minus gold) librarian on that server, and have traded for stacks and stacks of emeralds, from him going through dozens of double-chests worth of paper, and still the gold trade hasn't popped up. Yeah I can take a look shortly when I get back to my pc. In my village I've only managed to find 2 priests with the gold trade, no librarians or black smiths. From the code it appears that only priests and blacksmiths are supposed to get the gold trade. If the villager does not have a profession, for some odd reason, when the game sets the villagers trades (the game sets the trades before the profession), it will default to the gold trade. I'm currently trying to figure out how this scenario would happen though. The only trades that a librarian are supposed to have are: Buying paper, buying books, buying written books, selling bookshelves, selling glass, selling compasses, selling daylight sensors, and finally, selling enchanted books. I'm currently also trying to find out the frequency of the gold trade appearing for blacksmiths and priests, but I can already tell the most common occurrence of the gold trade is with blacksmiths. From the code it appears that only priests and blacksmiths are supposed to get the gold trade. Well, I've seen a librarian that had it, as the very first trade (this was in 1.6.2, on a vanilla SMP server.) I took a pic, although since you can't really tell what his profession is, you'll just have to take my word for it that it is a librarian, and after I gave him some gold, he asked for paper next. Glitch, or what? EDIT: I guess you can kind of see his white robe beneath the GUI there, behind my health and hunger bars, if you look real hard. Sorry lol not day light sensors, I meant a clock. And yes I believe you, that is his first trade, correct? Like i said the game will default the first trade to gold if the profession is set after the selling list is added to the villager. I'm not sure when this scenario happens, but I have a feeling it may occur occasionally when a zombie villager is cured. Ok, I believe I've figured out how the game calculates which item to pick when picking trades. The gold on other villagers Isn't actually a bug I've found out, it's just a very rare occurrence compared to either the priest or blacksmith, with it being easier to get on a librarian versus the other villager types. Every single time the game attempts to get a new trade (or the initial trade) this happens. The game takes every possible item for a villager trade based off their profession and attempts to add it to a temporary list based off a percent that it will succeed in being added to the temporary list. If none of the items succeed in being added, then the gold trade is added to the temporary list instead. Then the game shuffles the temporary list and adds the trade which ends up at the top of the list to the villagers actual buying / selling trades. If the villager already has the trade, then it will lower the cost of the trade it already has. So you can apparently get the gold trade (not as a bug) on any type of villager. But in order to do this, every single item from all possible villager trades for that specific profession must fail to be added to the temporary list. So, the more possible trades the specific profession has and the percent chance of that trade being added to the temporary list will effect the outcome of getting the gold trade. Blacksmiths and priests get the gold trade from their professions so it is easy for them to get the trade, especially the blacksmiths. But out of the remaining professions, the librarian has the lowest amount of different trades, and the percent chance of those trades being added to the temporary list are a bit lower compared to the remaining professions, so the librarian would be the third most common type of villager to get the trade. But it is still very uncommon for this to happen. Edit: Whew, that was a pretty complicated bit of code there. But I'm pretty sure how I just described is accurate. If you have any questions about my explanation let me know. Is it (or does it have anything to do with) the "probability value" assigned to each trade (except gold) on the wiki? Are those just straight probabilities, example wheat has a 90% chance to be added to the temporary list, wool has a 50% chance, fish has 40%, etc.? And then, once they're on the list, are they weighted at all, or is it just a straight shuffling of whatever makes the cut? You did a great job explaining it, I think I get it pretty well except for the probabilities as I mentioned above. That's correct, those probability values on the wiki are the same values I was talking about for the probability of it being added to the temporary list. When it shuffles it does not appear to be weighted at all, it's just using a completely list random shuffler based off of some standard pre-made java code which has nothing to do with any game code to make it weighted. And yes, any villager can get the gold trade if it fails to add anything to the list during the update. The "actual probability" listed in the wiki for the gold trades is the chance that every single other trade fails to be added to the temporary list, and since its the only one on the list even with a shuffle it will still be the only one there and can ruin your perfect villager. That is why every villager type listed has a trade for gold. However, I missed one line of code which made it look like priests and blacksmiths shared the gold trade as an actual offer they are supposed to have for their profession. Priest do not have the gold trade as a standard trade for their profession, however, since the actual amount of trades they have is so few, and the probability values of them are so low that the gold trade comes up on priests more than the blacksmiths, who actually have gold as one of their profession's trades. Skeletons are the bane of my existence. Thanks for the detailed analysis, Crumpetxxix, and the confirmation screenshot from your villager, IronMagus. I tried played around with some calculations to see exactly how the "Actual Probability" column on the wiki is derived from the "Probability value", but couldn't get anywhere useful. The footnote said it is derived from "all possible list of potential offers", which I'm not exactly prepared to replicate. But for just calculating the gold chance, it should be simpler than that, right? I just need to figure out the chance that none of the other trades will be added to the preliminary list? So, if the "probability value" is the chance that trade is added to the list, shouldn't I just multiply (1 - Prob Value) for all the (non-gold) offers? So when I do this for the Librarian (0.2666%), Farmer (0.0044%) and Butcher (0.794%) I get values that match the wiki. When I calculate for the Priest, though I get 10.12% instead of 15.60%, so I'm not sure what's wrong there. I didn't attempt to calculate for the Blacksmith, I know he is different. I don't know how they actually derived it, I assumed they just wrote a quick program with the same code that does the trades and got the result through that. It seems like it would be very complicated to derive a formula for it. Yes, the gold chance will be a lot easier because it essentially skips the shuffle of the list since it is the only item in the list. This would simplify a lot because otherwise you'd first need first find out how many trades actually made it to the temporary list for another trade. So essentially you're skipping a step because the probability of you picking the gold trade out of the only trade is 100% lol. Im not 100% sure what you did wrong but I'm not the best on the math of it all, I'd at least have to see how you calculated it to make any attempt to figure out what you did wrong.